I really had no idea what to expect from this show. The promoter, Rosemary Krieger, decided that the summer antiques show needed a radical change. Attendance at O’Hare the past few years has been steadily declining. 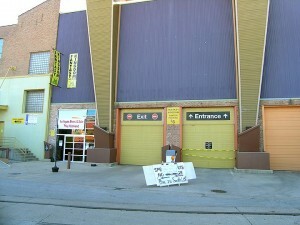 So she moved the show to a new venue in downtown Chicago to a building in the Sono section. She’s used this building before for her Modernism show, so she was familiar with it and the neighborhood. Personally, the show went well for me, with Tiffany Studios items, including glass, lamps and desk items garnering the most interest. However, every single sale was to an existing client of mine and that was disappointing. Part of doing a show, especially in a new venue, is to meet new clients. I do wish to thank my loyal clients for their business. In speaking personally to a handful of dealers at the show I heard the following comments. One dealer complained that it was one of the worst shows he had ever done. 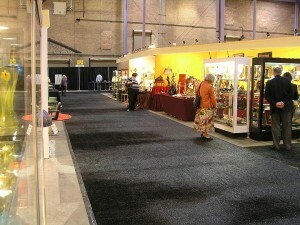 Another dealer did moderately well and told me that he thought the show had very good potential. A third dealer told me he did fairly well and a fourth dealer complained about the light attendance at the show, especially on Sunday. She thought the show promoter had done a poor job of advertising. In her view, the promoter should have advertised aggressively, as this was the first time in a new location. She also complained that there weren’t enough signs in the neighborhood pointing to the location of the show. Show promoters have a tough job. They have to satisfy both the dealers and the public, so it’s a balancing act for them. What the promoters have to realize is that the dealers are their clients, not the public. Promoters need to make life easier for their dealers. That means that the hours of the show should be consistent with giving the buying public enough hours to shop the show but not making the hours so long that it becomes a burden on the dealers. Shows don’t need to open early on Sunday because no one comes early on Sunday. Shows don’t have to be open late on Saturday because the public leaves early to go to dinner or the theater. Irene Stella has it right with the Pier shows in New York City. They’re open to the public only on Saturday and Sunday. Everyone makes it their business to get there during show hours. Part of the reason that dealers do well is because there’s action and electricity at her shows because things happen fast. Make up your mind soon or that item you’re admiring will be gone. It’s good for everybody — fewer days, shorter hours and the same amount of business. Read the directions. Good advice. We didn’t follow it. The show set up today, but setup is usually two days and the show three days, so we booked our flight to Chicago for Tuesday, so we could set up on Wednesday. Then we got a call from Bill, our employee, informing us that the show sets up on Thursday. Oh well! It could have been worse. We had Wednesday free in Chicago, so we relaxed. Brunch was at Toast. If you’re not familiar with it, it’s a great place for breakfast. There’s a wait on weekends, but no problem on a dreary Wednesday. The eggs Benedict were to die for. The mascarpone filled French toast was equally fantastic. The gym in the afternoon, followed by a professional massage. Dinner at Tiparos Thai Restaurant on Clark St. — very good, not great. It was a tough day, but somebody has to do it. Today, Thursday, was setup day, but we were under pressure to get it done in one day. Nottt! Read the directions! 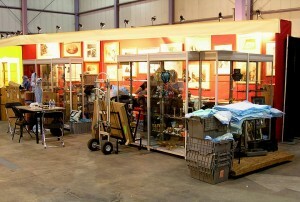 The show doesn’t open to the public until 5 PM on Friday, so we have most of the day on Friday to continue setting up. It took a lot of pressure off the setup when we finally found out. The show is small but good quality, with a number of west coast dealers who are on the way to Baltimore next week. It’s an opportunity to see their items before the big show. 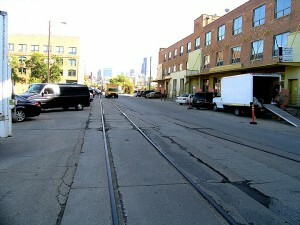 It’s in an up and coming neighborhood called SONO, which stands for south of North Ave. I have never seen so many young mothers and children in one neighborhood in my whole life. There’s lots of construction, so the neighborhood won’t look the same in a few years. Come visit the show and see what’s available. I’ve brought some treasures, so I’m looking forward to seeing you there and showing them to you. Monday, I’ll blog about the results. Should be an interesting show because of the change of venue. I don’t have any idea what to expect. Parking is no problem because it’s free in a large lot, 1/2 a block away. Having exhibited at hundreds of shows over 35 years, I’ve seen attendees do some unusual and sometimes unacceptable things. As a service to the showgoing public (and also to me), I’ve decided to write about some of them as suggested guidance. I would think that some of them are obvious, but apparently not. It is totally unacceptable to open a closed showcase and handle the merchandise without first asking permission. This really has me scratching my head. It’s completely obvious to me, but not to the people who’ve done this in my booth. The first thing I think is that the person may accidentally damage an item. Then I question whether this person might be a shoplifter. It feels like someone has come into my house and started opening the drawers. Some jokes are older than rocks. Here are a couple. After asking the price for an item and finding out it’s expensive, I frequently hear “Do you have a pair?” Arrgghh! How about this reply? “I’ve got such good taste.” May I suggest “Thank you” or something similar? Is it OK to negotiate? Absolutely, it’s expected. I suggest asking “What is your best price?” or “Can you do better?” Making an offer is also quite acceptable. “Would you take $X?” The dealer may say yes, no, or make a counteroffer. If you make an offer, you’re on the hook, so don’t make one if you’re not prepared to complete the transaction. “I’ll give you $X dollars” gets some dealers quite upset. I think it makes them feel like peddlers. It doesn’t bother me, but some dealers see red. It’s not OK to take photographs in a dealer’s booth without first asking permission. Some dealers prefer that no photos be taken, as an additional layer of security. My Icart etching doesn’t look good. What can I do about it? Most Icart etchings that are in original frames with original mats have problems, such as foxing, light darkening, glue or acidity, amongst others. Read yesterday’s blog for a more complete explanation. Some people like them that way. They show their age (usually 70-90 years old). They’re probably authentic (it’s difficult to fake the brittleness and other signs of age). They have character, with nicks in the frame and faded mats. The problem is they’re getting worse, year after year. The degradation continues with constant exposure to high acid levels, bright light and humidity. Remember the value is in the etching itself, a sheet of paper. It’s the cake, while the mat and frame are the frosting. Good restorers are capable of reversing most of the damage that’s accrued in almost a century. The process starts by removing the etching from the frame. That’s pretty simple. There is usually a paper backing that can be torn off. (It can’t be reused so it doesn’t matter if you tear it off.) Below that is the backboard. That’s usually held in with many nails around the perimeter on older frames. Later frames may have framing points. Either one can be removed with a flat screwdriver and a needle nose pliers. Then the backboard is removed to get to the etching underneath. Depending on the technique of the original framer (and they had many different styles), the etching may be a loose sheet that’s taped on the top or the edges (that would be the best). Usually the etching is found within a glue sandwich — glued to the board in the back and the mat in the front. Every variation is possible — the etching may be glued only to the mat in front, or only to the board in the back or only glued around the edges or best of all, no glue at all. The restorer then puts the etching in a full bath and begins the process of separating the paper from anything it’s glued to and then to removing the glue itself. Sometimes the glue softens and the job of removal is facilitated, but on occasion the glue is tenacious and removal becomes a very labor intensive and time-consuming process. 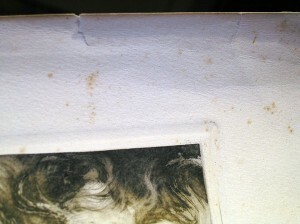 It’s very easy to damage a soaking wet etching, so this job should be left to a professional. Once the sheet has been freed, a chemical process is started that in most cases can reverse most of the effects of aging. (Sounds wonderful to me. I’d like to get dipped myself and see if I can reverse the effects of aging.) If it’s done properly, the foxing can be eliminated and the light darkening and acid burns can be reversed. The etching is then thoroughly washed, which eliminates most of the acid. A buffering solution can be added to slow down future acid buildup and finally the etching is dried in a press. Most of the hand-painted details like lipstick are lost in the restoration process and have to be reapplied by hand. Now the etching is a loose sheet that looks almost as good as the day it was made. It’s ready to be framed properly by modern standards. That means that non-acidic materials are used in the framing and mounting. Rag mats are made of cotton and are pH neutral (A pH of 7 is neutral). Anything that comes in contact with the etching either is acid-free or separated by an acid-free barrier. 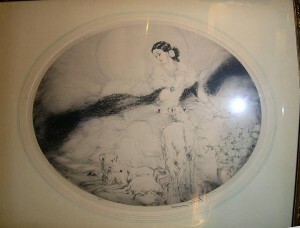 With proper conservation and framing, your etching will look great and last for many more years. Contact me if you have an etching that needs conservation. My Icart etching doesn’t look good. What is the problem? 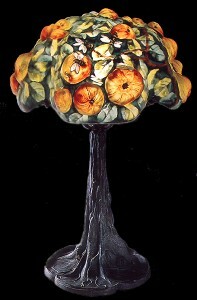 Icart was most popular in the 1920s and ’30s. At the time, it was fashionable to give a gift for a wedding or special occasion, rather than money. What better gift than an Icart etching? They were beautiful, signed by the artist, limited edition, and reasonably priced, most in the range of $15-30. The sellers of the art, mainly art galleries and department stores, were not interested in the art as investment, so they were expedient in framing. 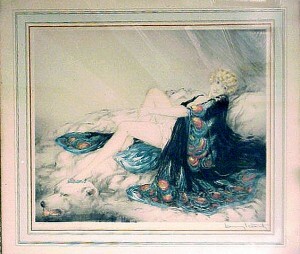 Icart "Silk Robe" in original frame. The mat is glued to the etching and the etching is glued to a board. What was done that was expedient? The worst offense was to use glue. Loose sheets of paper do not usually lay flat when framed, especially in humid areas. So the problem was solved by gluing the paper to a board, usually with horse glue. Most times the etching was also framed with a mat in front that was frequently glued to the etching. The second problem is acidity. Paper is naturally acidic due to the acid in pulp, mainly tannic acid. Over time cellulose fibers in the paper break down and add to the acidity. The framer’s offense was to use acidic mats and back boards in framing the etchings. These materials were in constant contact with the etching, allowing acid to leach onto the paper. All of these acid sources contribute to the problem. The acidity causes the paper to weaken and degrade, making it brittle and yellow and eventually destroying it. The third problem is called light darkening. This is the process by which an etching darkens when struck by sunlight, getting worse year after year. Sometimes the darkening is so severe that it’s difficult to make out the image, but that’s rare. Usually there is slight to moderate darkening. The last problem is called foxing. 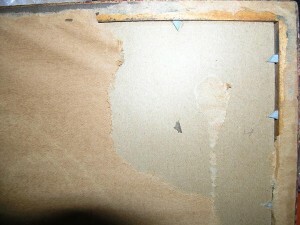 This is usually (but not always) caused by fungal or mold growth on the paper, aided by high humidity. It shows up as brown spots. 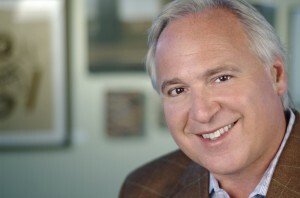 David Rago is the owner of the Rago Arts and Auction Center, in Lambertville, NJ, specializing in 20th century design. He also appears on The Antiques Roadshow as an appraiser, specializing in ceramics, porcelain, 20th century furniture, and vintage wine. I submitted several written questions to him. Q. How has the recession affected your business? A. The recession has affected our business in several ways. Most prominently, securing good consignments at reasonable price levels has become the most challenging part. We don’t believe we can BEGIN to evaluate pieces (in the form of estimates, which are driven by reserves) at 2008 or maybe even 2007 levels, which discourages many consignors from giving up pieces. I try to balance our and their expectations by saying that we often get prices at or above levels of a few years ago, but the approach now is to let pieces seek their prices through competitive bidding, NOT by starting at strong prices. We’ve found that buyers/bidders simply don’t want to be told that, to get their hands in the air for an opening bid, they have to be willing to pay anything near what used to be accepted retail. The old auction belief that, to get a record price you have to risk getting a record low price, has never, ever, been more true than now. 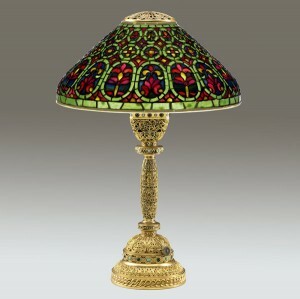 We sold a Tiffany Venetian lamp in our last major sale (June 09) with an estimate of $27-32k. It was a rare version with strong glass in pristine condition, fresh from an estate. It brought $81k, a record for the form. 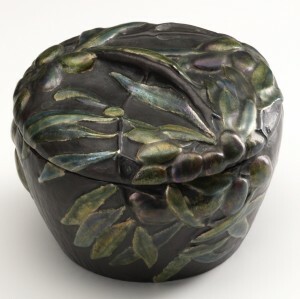 In the same sale we had a Tiffany enamel on copper box, almost as clean as the lamp, also fresh to the market, with a fairly strong estimate of $45–55k. Even though we had six “players”, I mean real bidders, on the phone, no one hit it once. We ended up selling it after the sale for under the low estimate. My contention was that, if the estimate were $30–40k, we’d have gotten the $50k for it. Q. What areas show strength? Weakness? A. Good things, in good condition, at reasonable prices, seem quite strong. Middle range things with condition issues, offered at regular prices, seem to languish. We just sold the estate of an old school New Hope dealer. The material had been off the market for 25 years and the family put no price restrictions on estimates and reserves. The sale was 100% sold and hammered near the high estimate plus the buyer’s premium of 20%. There was almost no glass in the collection, so this is relevant only in how it informs the marketplace. But we had a room full of active bidders, plus 100 people on the phone, plus 500 people on the Internet, for two solid days. It was like nothing had changed. But one thing HAD changed seriously, and that was the expectation of the seller. Q. What do you foresee for the coming year? A. The coming year is at the mercy of the economy, which is at the mercy of I don’t know what. Right now people (at least the ones buying art) mostly have more money than they did five years ago but they feel like they have less because they aren’t as rich as they were a year or two ago. Whether you own stock or real estate or middle range art, you in fact have less. Until people begin to feel comfortable with both their level of wealth AND the state of the economy, I don’t see great changes in the marketplace. When I first started collecting and selling French cameo glass over 30 years ago, there were red flowers and blue flowers and yellow flowers. Then one day a Japanese client asked me the name of the flower on the vase I was offering. What a strange question! Nobody had ever asked me that question before. Now suddenly I had to become a botanist and know my flowers. Well it’s a good thing I did because the market has changed dramatically since then. 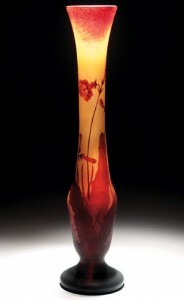 Japanese buyers changed the nature of the French cameo glass market. They were very particular about which flowers they wanted and which they didn’t. Violets were their favorite, with roses and poppies tied for second. Then in 1990, Japanese buyers suddenly dropped out of the market because of a crash in the value of their real estate. As a result, one might think that Japanese buyers have little impact on today’s market, but their influence remains strong. The flowers favored by Japanese buyers earlier are the ones that are still favored today. 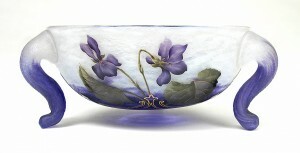 As an example, Daum vases with violets can sometimes command double the prices of similar vases with different flowers. Vases by Daum Nancy with tobacco flowers are more sophisticated than other similar vases because the flowers on these vases are almost always wheel-carved. The problem is that the flowers are not enameled, so the color is too similar to the background. Most buyers don’t find them as attractive as some other flowers. 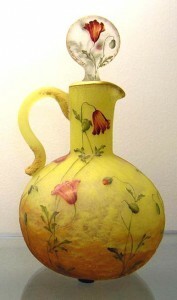 This is one of those instances where even though the technique and quality are excellent, the vases are difficult to sell. In the early 2000s, I received an email from a lady who had found my website through the Internet. She told me that she had purchased a vase, signed Galle, and that she would like to have it authenticated. I told her that my fee for appraisals or authentications was $100. She agreed and drove all the way from North Carolina to New York to show me the vase in person, which ordinarily would not have been a wise thing to do, but I did tell her that I thought the vase was probably authentic. She told me that she had gone into a shop and spotted the vase on a high shelf. The owner of the shop said he had purchased an estate and the vase was part of it. Apparently he didn’t think it was authentic because he priced it at $500. The lady purchased it because she thought it was pretty and at $500, it was worth it, even if it weren’t authentic. Upon seeing it in person, I confirmed that the vase was indeed authentic. 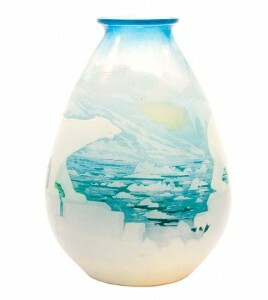 It was a rare Galle polar bear vase. 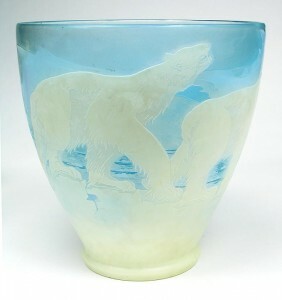 Galle polar bear vases come in two different shapes (or models). This one was the less desirable of the two, but I for one do not look a gift horse in the mouth. The owner wanted me to sell it for her on consignment and take a commission upon its sale. With this arrangement, there was no charge for the appraisal. It took me a while, but I sold it for $30,000. She was thrilled and I was as pleased as punch with my commission. This kind of find used to happen more regularly than it does nowadays, but it still does happen. One day while sitting in my shop at the Manhattan Arts &amp; Antiques Center in the late 1980s, I received a call from another dealer asking me if I had any Pairpoint puffy table lamps for sale. He said he had a client interested and asked if I would give them to him on consignment. I had a beautiful Pairpoint Apple Tree puffy, which I gave to him. I didn’t hear from him for a couple of weeks and I was curious as to what had happened. I bumped into him at a preview for an auction in Manhattan and asked him about the disposition of the lamp. He had forgotten to tell me, but replied “Oh, yes, Goldie took it”, as if everyone were on a first name basis with her. I said “Goldie, as in Goldie Hawn?” And he replied, “Yes”. Some time later, Goldie Hawn and her long-time partner, Kurt Russell, appeared in a magazine that showcased their beautiful home. There behind the sofa was the lamp. So, Goldie, if you’re reading this, I hope you’re still enjoying it. Write to me. In the 1970s, I thought I had made friends with an auctioneer named Jerry Schuster. He had an auction house in New Windsor, NY, about an hour north of NYC. I visited him one day while driving past. He had what he said was a Tiffany Acorn lamp. In the years since my first signed lamp purchase, I was becoming an expert in Handel reverse-painted lamps. There were no Handel reverse-painted reproductions on the market, so getting a good education wasn’t that difficult. I had never purchased any leaded lamps because there were reproductions around and I couldn’t tell the difference. Jerry didn’t have the best reputation, so I asked him if he would guarantee the authenticity of the lamp. I remember what he said almost verbatim. “I don’t guarantee anything, but I guarantee this lamp to you.” So I paid him a fortune for the lamp, about $3,000. 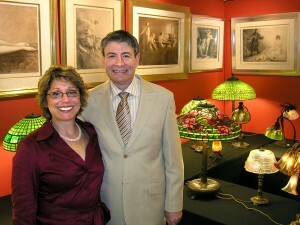 I took the lamp home and made some calls to collectors and dealers, including Alice Osofsky, an old-time dealer. She came to my house with a friend, and after examining the lamp, told me the lamp was a reproduction. 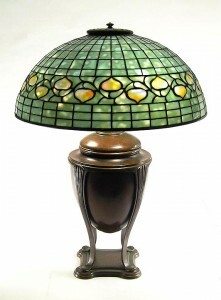 My heart sank, so I called other dealers and they all agreed – the lamp was a fake. No problem! I’ll call Jerry and he’ll give me my money back because he guaranteed it to me. “Jerry, the lamp is a reproduction, so I’m returning it.” “What are you talking about, Phil? If you have an expert to say it’s a reproduction, I have another one to say it’s not.” Again, this is almost verbatim. So this was one costly lesson. I sold it to another dealer, telling him the truth that I was told it was a reproduction. I took a big loss on the lamp, but it was gone and at least I recovered some of my money. And now I have my own blog and I can tell Jerry and the rest of the world, it couldn’t have happened to a nicer guy!